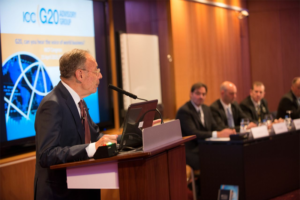 ICC Chairman Gerard Worms announces the launch of the ICC G20 Advisory Council. The collaboration of these unique global business networks aims to ensure inclusion of the views and priorities of international business. These networks represent thousands of chambers, grouping millions of companies, and they also span a wide demographic, cutting across borders and sectors. “ICC, along with its national committees and World Chambers Federation, constitutes an unparalleled international network of companies, from multinational corporations to small- and medium-sized companies. These businesses are the everyday practitioners of the global economy and, consequently, have a clear stake in the success of the G20,” said ICC Chairman Gerard Worms. “ICC is the world’s largest business organization and the only one present in an extensive network of countries,” said Lorenzo Ysasi, WCF Vice Chairman and Special Representative to the ICC G20 Advisory Group. “This collaboration is needed to tap a broader base of companies worldwide,” he said. The partners agreed on a plan to drive a series of consultations with business worldwide to further shape global business input to G20 leaders. The Council’s collective reach will enable the expansion of the policy consultations ICC has held with local business and G20 Sherpas in national capitals over the last year, including Mexico City, Hong Kong, Zurich, Doha, Istanbul, Washington DC, Beijing, Melbourne, Jakarta, Johannesburg and Berlin. The new Council will also deploy a set of modern, Internet-based tools to reach and include its extended business constituents from all corners of the world. Ahead of this year’s G20 Summit in Saint Petersburg, the Council will launch the seminal ICC Global Survey of Business Policy Priorities for G20 Leaders, soliciting international business priorities on G20 topics. The Council initiative is an outgrowth of the ICC G20 Advisory Group, comprising 30 international CEOs who have been delivering business policy to recent G20 Summits.